We woke up at the Safe Haven B&B and indulged in quite the breakfast. Alannah started us off with homemade granola, yogurt, and fruit. I had golden kiwi for the first time and it may now be my favorite fruit! 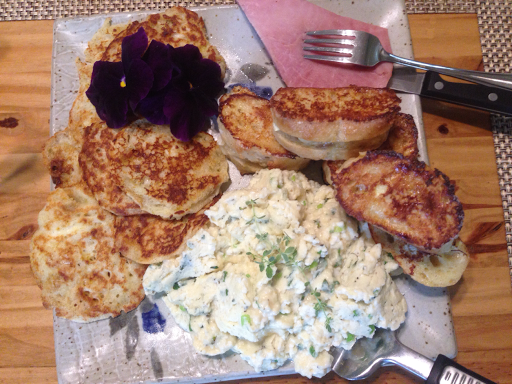 She also made these mini banana French toasts, scrambled eggs, and mini lemon pancakes with cardamom spice. She even put pansies out and we each ate one. I had no idea they were edible! No taste really. I felt like I was eating velvet. We were so full that we couldn’t have any of the homemade breakfast muffins. Allanah took care of that and sent us off with what seemed like an extra half pound of muffins and cookies! She and Dan are so hospitable to GDTers. I ate so much that I’ve moved my button on my waistband back to its regular position! I have two buttons since my pants tend to fall as I lose weight hiking. Not on the GDT if this keeps up! I was able to finish just about everything I needed to do on the computer before we left. I did end up ordering a new camera…third one this summer:/…and was not happy that with the purchase of new shoes, the camera, and other town expenses, I coughed up $400 over this town stop, crap! The camera I somehow broke should be repaired under warranty, but it will take at least a month, so I just ordered another one to have it in a week and for later when I break or lose the eventually repaired one. I swear, you all should invest in Panasonic with how much I am apparently breaking/losing cameras! This leg of the GDT won’t be as large and epic as the last. The GDT isn’t all glorious ridge walking. It also has its share of road walking and overgrown bushwhacking trail. 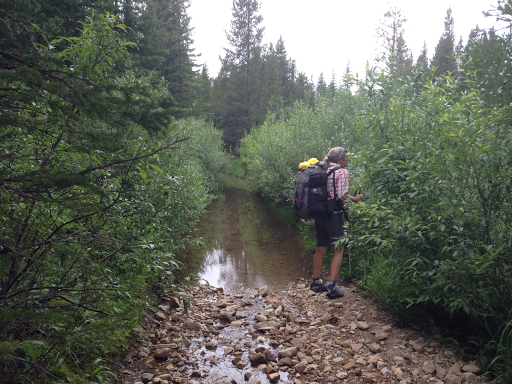 This section has a fair amount of that road walking and bushwhacking. It is one of our longer legs of 7 days, with the possibility of finishing a night early again. 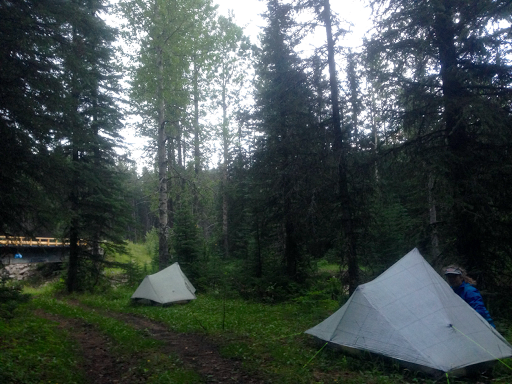 Knowing we had a day of road walking ahead and just 15mi/24km to do, we waited until 10am to leave the Safe Haven. With Alannah’s homemade baked items in hand, we headed out of town. 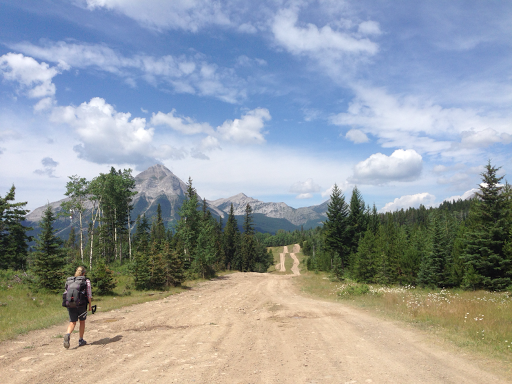 The trail follows the highway for a bit before turning off onto dirt roads and eventually ATV roads. 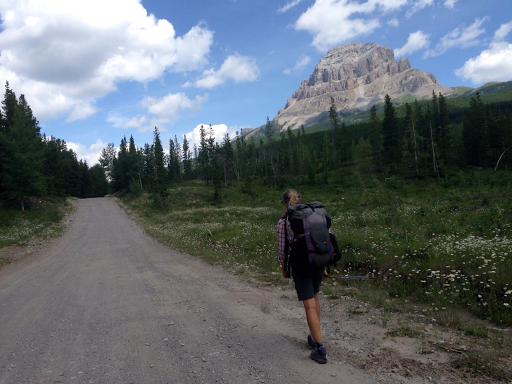 For awhile, we hiked around Crowsnest Mtn (name of area/pass that Coleman is near) and saw it from many angles. Not much to say about today other than that we are still loving it! Even with the road walking! The temps were PERFECT at 70F/21C and a slight breeze. It had a tranquilly to it that we both just soaked in. 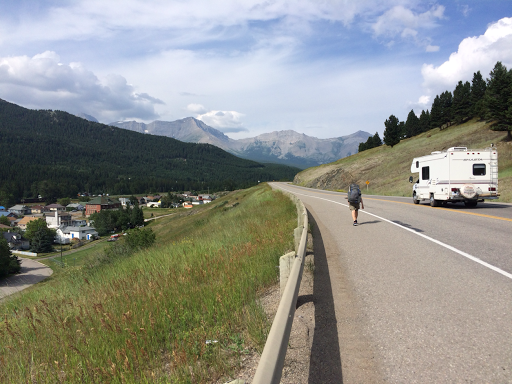 Scenery was great and we both were relaxed and thankful to have road to cruise on while carrying out 7 days of food. We were so zen that we missed a turn (there are many intersecting roads) and I thankfully happened to glance at the GPS for the name of a mountain to notice that we were .3mi off trail. Whew, that could have been worse with how we were cruising! Again, I’ll mention that we have an itinerary to meet our permitted sites starting in 2 weeks. E did a great job of making us a detailed itinerary on a spreadsheet that is a great guide for us and gives us buffer time for unexpected delays that may come up. We may get ahead of our conservative schedule again and earn another zero in our next town. It will be pretty funny if we end up doing this each town! Today, we ended up easily going 5mi/8km over our guesstimated mileage. There are plenty of things that can still slow us this leg though. 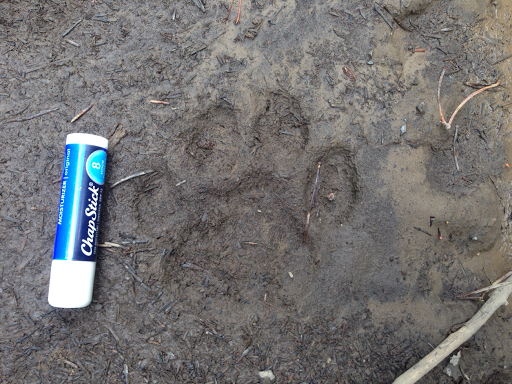 Maybe a mountain lion or cougar!?!? There is a good deal of rain forecasted for the second half of the leg and we don’t know how slow the brush will be. 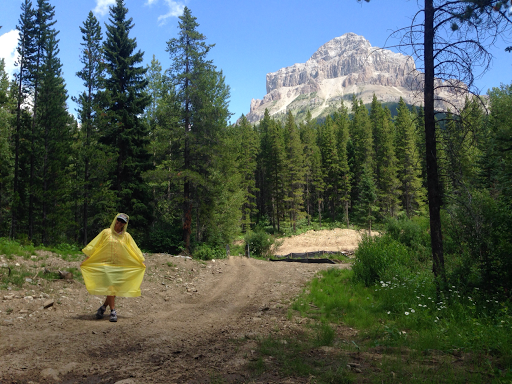 Speaking of rain, there was a nice big poncho next to our lunch break stream. It was left behind from that ultra run that went through the area this weekend. Knowing its most likely going to rain a lot, E took the poncho as a third line of defense after her older rain jacket and small umbrella. She was pretty excited about it and the yellow color. As we walked the road, we ate most of what Alannah gave us. Really hit the spot and bakery quality baked goods! 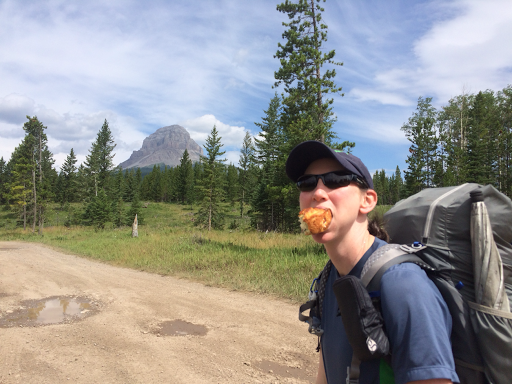 Here I am with a yummy fruit infused muffin and my new sunglasses (left the other pair in Waterton in my car!). That’s Crowsnest Mtn. As the roads went on and became more narrow ATV roads, we had large puddles to work around. Fortunately, our feet stayed dry. We both have new shoes we got in town. E with her regular Salomon Exit 2 Aero and me with my new Salomon XR Crossmax 1.0. We both are very happy with the new shoes! 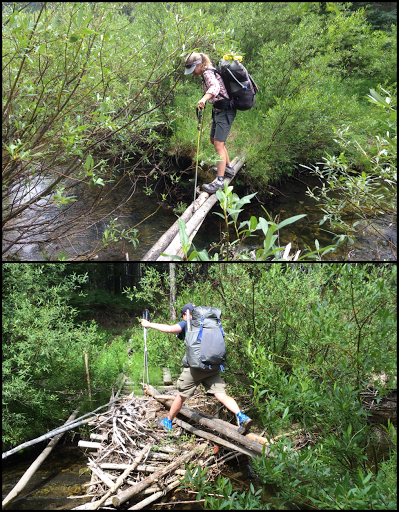 We finished up the day at a bridge and camped near a nice stream that is lulling me to sleep. We had fun eating dinner up on the bridge and watched dark clouds move in overhead. Just as we finished hanging the food bags off the bridge (seen in the background of our campsite photo), the rain started to fall. Perfect timing and we ran into our tents. It came down hard for 30mins and is now a drizzle.